This cable is not an original,but with Top quality. 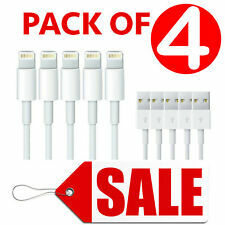 Cable Length: 1 M.
IPhone 5/5S/5C/6/6 Plus/6S /7 7Plus iPad 3/4 Air 2 iPad Mini iPod Touch. IPhone Models. iPhone XS Max. iPhone 8 Plus. iPhone 7 Plus. iPhone 6s Plus. iPhone 6 Plus. GENUINE LIGHTNING CABLE. iPad (3rd generation). iPad mini. iPad mini 2. iPad Air 2. iPad mini 3. iPad mini 4. iPhone 8 | 8 PLUS. IPad Mini, iPad Mini 2, iPad Air, iPad Air 2, iPad Mini 3, iPad Mini 4. iPhone 6s, iPhone 6s Plus, iPhone 7, iPhone 7 Plus, iPhone 8, iPhone 8 Plus, iPhone X, iPhone XS, iPhone XS Max, iPhone XR. iPhone 5, iPhone 5c, iPhone 5s, iPhone SE, iPhone 6, iPhone 6 Plus. IPhone 5, iPhone 5c, iPhone 5s, iPhone SE, iPhone 6, iPhone 6 Plus, iPhone 6s, iPhone 6s Plus. iPhone 7, iPhone 7 Plus, iPhone 8, iPhone 8 Plus, iPhone X, iPhone XR, iPhone XS, iPhone XS Max. The Apple Lightning Cable And Wall Plug Is Used To Connect Your iPhone To Your Laptop. IPhone 6s, iPhone 6s Plus, iPhone 7, iPhone 7 Plus, iPhone 8, iPhone 8 Plus, iPhone X, iPhone XS, iPhone XS Max, iPhone XR. iPhone 5, iPhone 5c, iPhone 5s, iPhone SE, iPhone 6, iPhone 6 Plus. 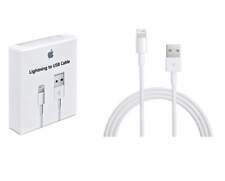 This USB 2.0 cable connects your iPhone, iPad, or iPod with Lightning connector to your computer's USB port for syncing and charging or to the USB Power Adapter for convenient charging from a wall outlet. IPhone 6s, iPhone 6s Plus, iPhone 7, iPhone 7 Plus, iPhone 8, iPhone 8 Plus, iPhone X, iPhone XS, iPhone XS Max, iPhone XR. iPad Mini, iPad Mini 2, iPad Air, iPad Air 2, iPad Mini 3, iPad Mini 4. iPhone 5, iPhone 5c, iPhone 5s, iPhone SE, iPhone 6, iPhone 6 Plus. 2M High Quality Cable! 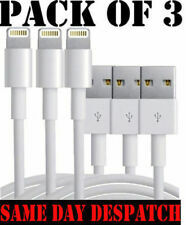 Compatible with All Apple Devices with 8 Lightning Pin Port. Markings On The Cable! Product Details. Official Genuine Apple product. These cables are compatible with charging with a USB plug and ultra-fast data syncing with your computer or laptop. Latest Model release. I will do my level best to accommodate that. IPhone 6 6Plus 5 5S 5C. GENUINE DATA CABLE FOR IPHONE 6 6 Plus 5 5S. 1 x Original MD818ZM/A Usb Data Sync cable 8 pins for iPhone 5 5S 5C 6 6 Plus bulk. iPhone 5s. iPhone 6s. iPhone 6s Plus. iPhone 5c. Genuine Apple Cable for iPhone 5 6 7 8 X iPod iPad Lightning to USB Charger USB 2.0 to Lightning (8 Pin) BRAND NEW QUALITY USB SYNC & CHARGER DATA LEAD CABLE FOR APPLE IPHONE 8, 8, 8P, X, 10, 7,7P, 6,6P, 5 5C 5S IPAD 4 AIR MINI. Fully support iTunes, Data Syncing and Battery Charging. Supports all iOS Software Versions including iOS9 to iOS 12.2 High-speed data transfer as well as charging via Plugs, Laptops and Car adapters. Premium Quality design fits all aftermarket cases & accessories. Colour: White High-speed USB 2.0 COMPATIBLE WITH Apple iPhone X / 8 / 8 Plus / 7 Plus / 7 / 6s Plus / 6s / 6 Plus / 6 / SE / 5s / 5c / 5 / iPad Pro / iPad Air / Air 2 / iPad mini / mini 2 / mini 4 / iPad 4th gen / iPod Touch 5th gen / iPod nano 7th gen.
IPhone 5/5S/5C, 6/6S/6 /6S , IPad 4/5/6 Gen, IPad Air, IPad Pro, IPad mini, IPod 5/6th Gen. 1 X Apple lightning cable (1M). 1X Apple certification and compliance booklet. 1X Apple one year warranty booklet. 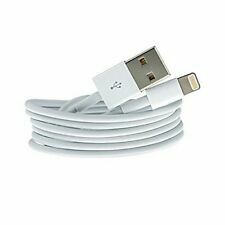 Genuine 1M Apple Lightning USB Charger Lead Cable For iPhone x 7 6 5 iPad 4 Air Compatible Models: Apple iPhone 10 Apple iPhone X Apple iPhone 6 Apple iPhone 6S Apple iPhone 7 Apple iPhone 8 Apple iPhone 7 Plus Apple iPhone 8 Plus Apple iPhone 6 Plus Apple iPhone 5 Apple iPhone 5S Apple iPhone 5C Apple iPhone SE iPad Air iPad Mini iPad 2 3 or 4th Generation Apple iPod Touch 5 Apple iPod Nano 7 Package Include: 1x Data Charger Cable (Lengths depend on your choice). Fast Dispatch !! UK Seller !! Money Back Guarantee !! This USB 2.0 cable connects your iPhone, iPad, or iPod with your PC' USB port for syncing and charging or to the Apple USB PowerAdaptor for convenient charging from a wall. IPhone 5, iPhone 5c, iPhone 5s, iPhone SE, iPhone 6, iPhone 6s, iPhone 6 Plus, iPhone 6s Plus, iPhone 7, iPhone 7 Plus, iPhone 8, iPhone 8 Plus, iPhone X. iPhone XS, iPhone XS MAX, iPhone XR. 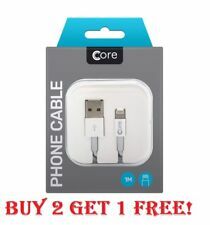 This USB 2.0 Cable Connects Your iPhone, iPad Or iPod With Lightning Connector To Your Computer’s USB Port For Syncing And Charging. IPhone 5, iPhone 5c, iPhone 5s, iPhone SE, iPhone 6, iPhone 6 Plus, iPhone 6s, iPhone 6s Plus, iPhone 7, iPhone 7 Plus, 8, 8 Plus, X, Xs, Xs Max. This 2m Apple Lightning Cable is used to connect your iPhone. IPhone 6s, iPhone 6s Plus, iPhone 7, iPhone 7 Plus, iPhone 8, iPhone 8 Plus. iPhone 5, iPhone 5c, iPhone 5s, iPhone SE, iPhone 6, iPhone 6 Plus. iPhone X, iPhone XS, iPhone XS Max, iPhone XR. 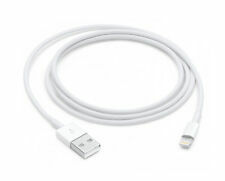 This 1m Apple Lightning Cable is used to connect your iPhone.